Many thanks for your letter of January 19th. I am delighted to hear that you are making the trip to Central America.In February and March 1935, Robert Woods Bliss traveled through the highlands and tropics of Mexico, Guatemala, and Honduras to see the ancient cities of the Maya. His traveling companion, Frederic C. Walcott, was at the time a trustee of the Carnegie Institution for Science of Washington and arranged the trip, which included visits to the archaeological sites under excavation by the Carnegie Institution for Science. For an outline and images of this trip, see http://museum.doaks.org/IT_1144 (accessed September 9, 2015). Mildred Barnes Bliss was not able to take this trip due to the illness and death of her mother, Anna Barnes Bliss, who died on February 22, 1935. I only wish I were with you. I have heard from Sangiorgi, who says he has also written to you, that he has had three ivories offered to him:These three ivories are referenced with photographs included in a letter from the Galleria Sangiorgi to Robert Woods Bliss, February 12, 1935, Byzantine Collection files, Sangiorgi correspondence. 1 / Annunciation,Annunciation, late seventh–early eighth century (? ), ivory, Civiche Raccolte d’Arte Applicata, Castello Sforzesco, Milan, inv. A.14. It was acquired from the Trivulzio Collection in 1935. The ivory has been variously dated. See Kurt Weitzmann, ed., Age of Spirituality: Late Antique and Early Christian Art, Third to Seventh Century (New York: Metropolitan Museum of Art, 1979), 198–99, no. 448; and Serena Ensoli and Eugenio La Rocca, Aurea Roma: Dalla città pagana alla città cristiana (Rome: L’Erma di Bretschneider, 2000), 590, no. 284. See also Byzantium and Islam: Age of Transition Seventh–Ninth Century, edited by Helen C. Evans with Brandie Ratliff (New York: Metropolitan Museum of Art, 2012), 46–47, no. 24H. reproduced by Venturi, Storia dell’ ArteAdolfo Venturi, Storia dell’arte italiana (Milan: U. Hoepli, 1901–1940), 2:608–09 and 2:616, fig.439. Vol.II. Fig. 439. 2 / A diptych of Justinian:Now in the Civiche Raccolte d’Arte Applicata, Castello Sforzesco, Milan. See Wolfgang Fritz Volbach, Elfenbeinarbeiten der Spätantike und des frühen Mittelalters (Mainz: Verlag des Römisch-Germanischen Zentralmuseums, 1952), 29–30, no. 25. Delbrueck, Consular Diptychen,Richard Delbrueck, Die Consulardiptychen und verwandte Denkmäler (Leipzig: Walter De Gruyter, 1929), 142, no. 26. In a letter to Robert Woods Bliss, dated March 23, 1935, Giorgio Sangiorgi writes, “The diptychon of Justinian illustrated in Delbrüch, page 26, mentioned in my previous letter is not free, having been put in the official inventory from the Italian authorities since many years.” Page 26. 3 / A plaque representing the Emperor Otto.Christ, Mary, Saint Maurice, Angels, and the Emperor Otto II and his Family, tenth century, ivory, Civiche Raccolte d’Arte Applicata, Castel Sforzesco, Milan. See Adolph Goldschmidt and Kurt Weitzmann, Die byzantinischen Elfenbeinskulpturen des X.–XIII. Jahrhunderts, vol. 2, Reliefs (Berlin: Bruno Cassirer, 1934), 15–16, pl. 2. He adds that he thinks it would also be possible to obtain leave to export an ivory representing the Holy Women at the Tomb,Holy Women at the Tomb, Early Christian, ca. 400, ivory, Civiche Raccolte d’Arte Applicata, Castello Sforzesco, Milan. reproduced by Venturi Vol. IAdolfo Venturi, Storia dell’arte italiana (Milan: U. Hoepli, 1901–1940): 1:79, fig. 61, and 1:114. Fig. 61, which is at present on the list of objects that may not be exported. The ivories 1 / 2 / and the Holy Women at the Tomb belong to Trivulzio.Luigi Alberico Trivulzio (1868–1938), Prince of Musocco and Marchese of Sesto Ulteriano. Trivulzio was responsible for the sale of much of his family’s art collection. I do not know what the Otto ivory is, but it may also be Trivulzio’s. The one representing the Holy Women at the Tomb is a very celebrated one, of exactly the same style, so near as very likely to be of the same hand, or at least school, though perhaps not quite as good, as the ivory representing the Resurrection and the Holy Women at the Tomb in the National Museum at MunichAscension and Women at the Tomb, ca. 400, ivory, Bayerisches Nationalmuseum, Munich, inv. no. 157. reproduced in our Vol. IL’art byzantin. Plate 96. Personally, I do not very much care for either of these ivories. They are highly accomplished but of a character in which, the Byzantine spirit is only beginning to be discernible and there is still a great deal of smug classicism. The Trivulzio Holy Women at the Tomb, however, has been vastly admired for a long time past, and would probably fetch an enormous price. The Trivulzio AnnunciationAnnunciation, late seventh–early eighth century (? ), ivory, Civiche Raccolte d’Arte Applicata, Castello Sforzesco, Milan, inv. A.14. It was acquired from the Trivulzio Collection in 1935. The ivory has been variously dated. See Kurt Weitzmann, ed., Age of Spirituality: Late Antique and Early Christian Art, Third to Seventh Century (New York: Metropolitan Museum of Art, 1979), 198–99, no. 448; and Serena Ensoli and Eugenio La Rocca, Aurea Roma: Dalla città pagana alla città cristiana (Rome: L’Erma di Bretschneider, 2000), 590, no. 284. See also Byzantium and Islam: Age of Transition Seventh–Ninth Century, edited by Helen C. Evans with Brandie Ratliff (New York: Metropolitan Museum of Art, 2012), 46–47, no. 24H. is an entirely different matter: to me one of the most beautiful and certainly one of the most important ivories in existence. It is the masterpiece of the school to which belong the plaques supposed formerly to have decorated the ivory throne of St. Marc [sic] which was given by the Emperor Heraclius to the cathedral of Grado.The so-called Grado Chair, a lithurgical throne given by Emperor Heraclius (reigned 610–614) to Grado, Italy, after his successful reconquest of Egypt. The chair was ornamented with carved ivory plaques. See Kurt Weitzmann, The Ivories of the So-Called Grado Chair (Washington, D.C.: Dumbarton Oaks Center for Byzantine Studies, 1972); and Byzantium and Islam: Age of Transition Seventh–Ninth Century, edited by Helen C. Evans with Brandie Ratliff (New York: Metropolitan Museum of Art, 2012), 46–47, no. 24H. There are half a dozen of these plaques in the Museo del Castello Sforzesco in Milan,Civiche Raccolte d’Arte Applicata, Castello Sforzesco, Milan: Saint Mark Preaching, no. 2; Saint Mark Healing Anianos, no. 3; Saint Mark Baptizing Anianos, no. 4; Saint Mark Consecrating Anianos, no. 5; Fragment with Saint Mark, no. 6; Annunciation, no. 14; Prophet with a Plaque, no. 7; and Saint Menas with Flanking Camels, no. 1. two in the Victoria and Albert,Saint Peter Dictating the Gospel of St. Mark at Rome and The Filling of the Water Pots at the Miracle of Cana, Victoria and Albert Museum, London, acc. nos. 270: 1-1867 and A.1-1921. one in the British MuseumRaising of Lazarus, British Museum, London, 1856,06213.26. and one in Cluny.Saint in Orant Pose, Musée National du Moyen Âge, Thermes et Hôtel de Cluny, Paris, Cl. 1932. 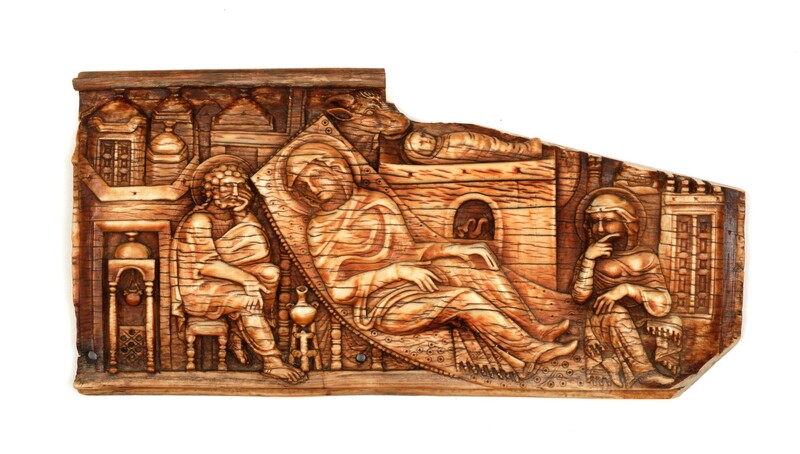 There are also “Grado chair” ivories in the Byzantine Collection at Dumbarton Oaks (Nativity of Christ, BZ.1951.30) and the Musée du Louvre (The Prophet Joel, AC 864). Eric Maclagan did a big article on the group: “An Early Christian Ivory Relief of the Miracle of Cana,” Burlington Magazine, April 1921.Eric MacLagan, “An Early Christian Ivory Relief of the Miracle of Cana,” The Burlington Magazine for Connoisseurs 38, no. 217 (April 1921): 178–79, 181–83, 186–88, and 190–95. The Trivulzio Annunciation, which I have seen and held in my hands and examined thoroughly by daylight, is so near the Grado group that it must be a product of the same school, but it is by far the finest work of art which can be ascribed to that school. I could spend hours enlarging upon its merits and its importance in the history of art. It plays a large part in our Vol. III.L’art byzantin. I can hardly imagine a more desirable object to possess, nor one that would be a more valuable possession from the point of view of stimulating research. I gather from Sangiorgi’s letter that he was not in a position, when he wrote it, to mention any price. I told him when I answered that he must let me know, as soon as possible, the prices asked for the objects he mentions. I shall of course give him no hint that I think you would prefer the Annunciation to the Holy Women at the Tomb. You will not be able to see the reproductions in Venturi and Delbrueck until you get back to Washington or New York. I am afraid there is not much chance of obtaining photographs of the objects. Trivulzio is extremely cautious. If I can, by hook or by crook, obtain photographs, I will send them to you. The reproductions in Venturi are very poor. In particular the one of the Annunciation gives no idea of the splendour of the original. I like the Justinian diptych very much, but I dont think you would find it as interesting a thing to possess as the Annunciation. Sangiorgi also mentions an early Byzantine jewel,Pendant and Reliquary, ca. 398–407, agate, gold, emeralds, and rubies, Musée du Louvre, Paris, acc. no. OA 9523. On one side, the names of Maria, her parents, and husband are arranged to form the chi-rho (the first two Greek letters of the name of Christ). This side reads (clockwise around a central cross): HONORI, MARIA (forming the curve of the rho), SERHNA, STELICHO. On the other side, the names of Stelicho, his wife, and children are also arranged to form the chi-rho. This side reads (clockwise around a central cross): STELICHO, SERENA (forming the curve of the rho), EUCHERI, THERMANTIA. On both sides, the horizontal bar of the cross reads: VIVATIS “May they live.” Between the two pieces of agate is earth, most likely from the Holy Land. The pendant, which had been in the Trivulzio Collection, was acquired by a member of the Montesquiou-Fezensac family, and was an anonymous gift to the Musée du Louvre on behalf of the Société des Amis du Louvre in 1951. See Kurt Weitzmann, ed., Age of Spirituality: Late Antique and Early Christian Art, Third to Seventh Century (New York: Metropolitan Museum of Art, 1979), 306, no. 279. with a Lombard mount in gold and emeralds, which sounds extremely attractive. I am urging him to send photographs of that. If I cable you about prices of above objects, I will call them 1) Annunciation, 2) Justinian, 3) Otto, 4) Women, 5) Jewel and will omit thousands, but specify the currency.